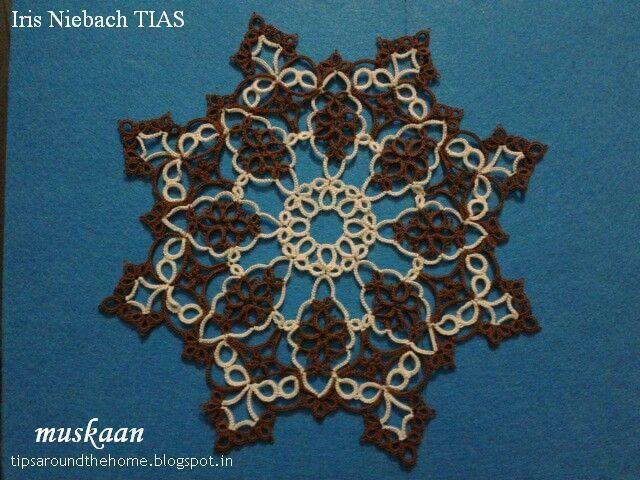 Confession #1 : I would never have chosen this doily to tat, despite it’s simple beauty. I would’ve argued that it’s all simple rings & chains, nothing new to learn. 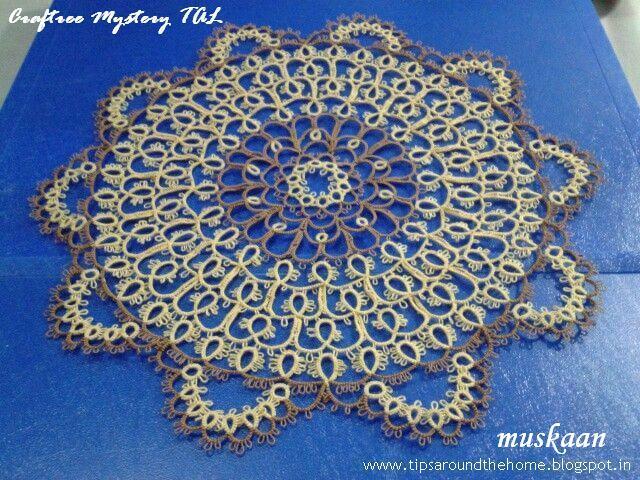 Well, it Is after all a Beginner’s doily. 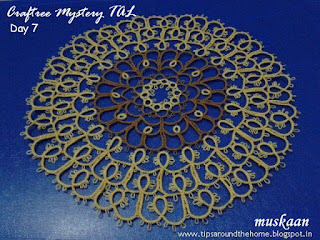 But I so wanted to try out a doily in size 40 thread, after seeing all those lusciously dainty laces belted out by many of my talented fellow tatters. (Many in size 80 , 100, .... I can't even count beyond that !) But 40 is as far I can go for a large project). So this seemed like the perfect opportunity. 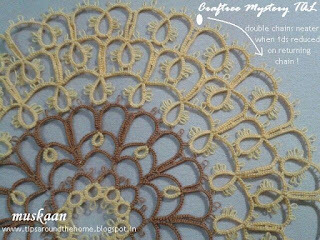 A beginner’s doily pattern being revealed in stages…. The Tat-Along began on June 1st & the last (9th) round was revealed on June 21st. Confession #2 : I Love it ! I enjoyed it all through … waiting eagerly for the next clue. And I am so happy I made it. Also, now I’m hooked to size 40, at least for larger projects. (I Will need to finish off my huge size 20 & 10 stash, but those will be for smaller projects). 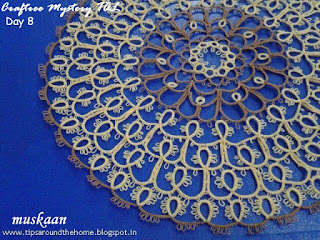 The doily looks so delicate & dainty to touch. Perfect ! 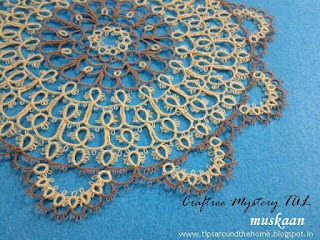 Anchor Mercer Crochet Cotton size 40 . Colour choice was by default. I don’t have many to choose from in this size, & these 2 were bought back in 2002 for a different, large project, that barely got off the ground. Measurements at end of each round are given under respective image. Single shuttle & ball tatting ; Lock Join . The pattern can be needle tatted easily, as many participants did. Optional techniques : beads, decorative picots, split chain, split ring . 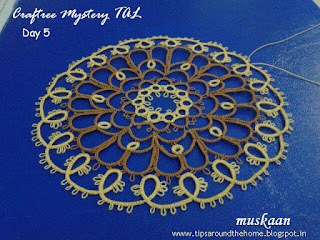 This 9 round pattern is by an Unknown designer, but presented in modern format by Kersti. She uploaded 2 versions for each round : a Beginner’s version & an Advanced version, accompanied by diagram. She also indicated joining picots & decorative picots. Accordingly, I made the decorative picots longer , but graded for most rings & chains. No picot gauge (I don’t like the pauses). The graded effect is not clearly visible, especially in photographs ; but it made the process more interesting. 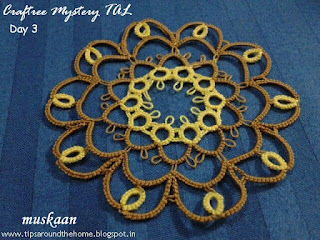 And I also used Weaver’s knot (tatman’s video) when adding thread. Unlike size 20, in size 40, it just does not show ! I adjusted the stitch count in a couple of rounds to avoid cupping/tightening. Details under respective photo. I am generally very pleased with the long chains in size 40. I used size 20 thread in Renulek’s Wiosna here (notice the black chains ?! ), & I never know how much to snug the stitches …. If I do it too tight, well it buckles; if I leave it a bit slack, then the chain slackens even more later ! 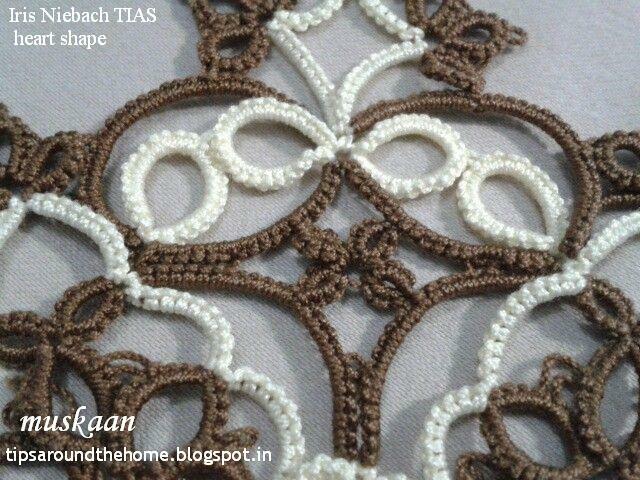 But with size 40, there is less elasticity in the thread, & one cannot over-tension the stitches ! Round 2 : Measures 2” across. Forgot to take a photo. No need to tie & cut after this round. At this stage, it looked like the centre of a Sunflower ! 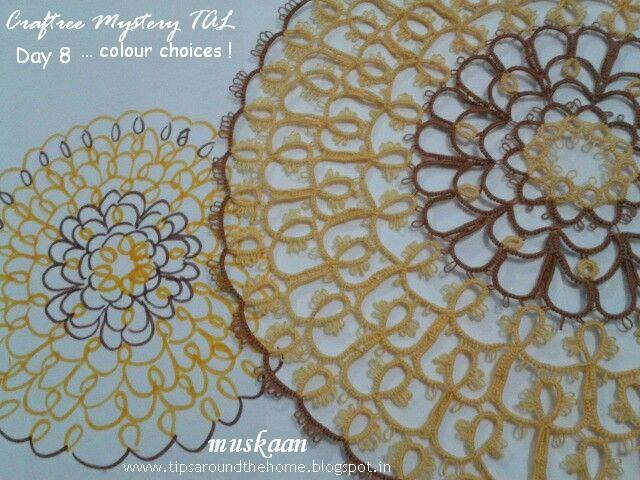 So I switched colours, took a leap of faith & decided to go with solid yellow for the ‘petal’ effect. Round 5 : measures 5” across. Halfway along, the round felt slightly tight . Thenceforth, I added 1 ds to the chains. I was unhappy with the long 'double' chain joins in this & the previous round. Changes made to double chain as indicated in previous pic. With only 2 rounds remaining, I wanted to bring back brown. But wasn’t sure where to use it. Did a quick coloured sketch with 2 options & asked my DH. He went traditional & chose brown chains. Added 1ds to chains to avoid tautness. This could well be a final round, especially with the brown acting as an outline, bringing it all in. Round 9 : measures 9½” across . Added 2 ds to ring where it joins between the chains of previous round. Worked well. Also added 1 very small picot to anchor the long chains between adjoining scallops. Some of the graded picots in most rounds are visible here. So that's it ... the ta-da... moment. LOVE the scalloped edging ! That’s it for the present. 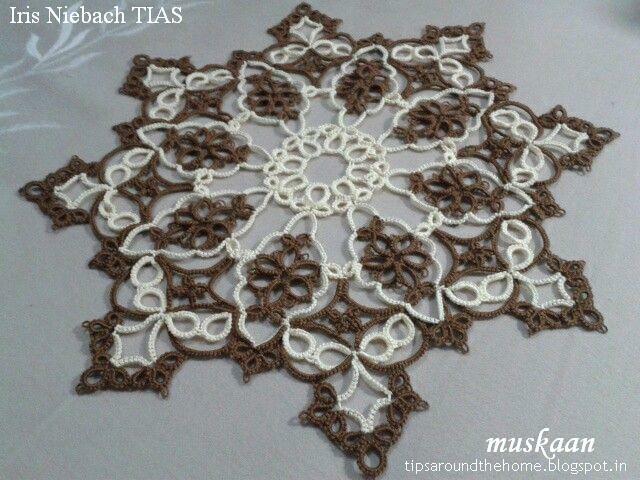 I hope my Doily-Mode lasts a tad longer so that I can finally complete the Wiosna . This is the Tat It And See (TIAS) that Iris Niebach shared in 5 stages in 2009. To me, it is a designing marvel . Brilliantly designed to create an elaborate medium-sized doily All In One Pass !!! And with a minimum of “advanced techniques” used ! Yes, it does take time to get one’s head around the orientation of some elements as one tats … Instead of moving in a circle as one is used to, here, we have to move in all directions : back & forth, up & down, in & out, …. But it is all so much fun because of this challenge . I found it easy enough to remember the stitch counts (pretty consistent), but the sequence was a whole other dimension even after 2 repeats ! So, to get my head oriented correctly, I notated the step sequence on the Day 5 pic (please scroll down for notated image) . Worked smoothly from then on. without any diagram or picture to guide them. At least I had the comfort of seeing some of their work posted on their blogs & knew what to expect . Anchor Mercer Crochet Cotton in Size 20 . 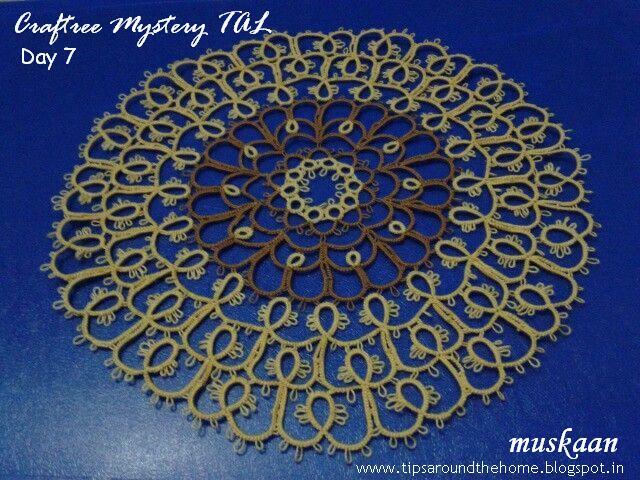 2-shuttle tatting, SCMR , Double Picot, Lock Join. The instructions are succinct & direct. RW is not always mentioned ; but Reverse Work when switching colours. Day 4 of TIAS ends at #37, but Day 5 starts with #39. Day 5 should start with #38 & follow on from there. Thus the total number of steps will be 50, not 51. Note : There is no change in Pattern ; only in the numbering. I have used the amended step numbers in the notation. Notations of step numbers on the pic, helped Immensely. The sequence to follow became clear instantly. If encountering problems, print out the notated pic & follow sequence. There is a correction made to the Day 5 pattern, which Iris includes in a later post here. All that is missing is a join to an earlier ring, nothing major. #3, 10, 41 & 48 are SCMRs, indicated by a white connecting line. Some steps in the notation indicate 2 parts (a & b), merely to highlight that ‘a’ is made first, then ‘b’. #38 is the DC chain, as indicted by an arrow. It was too cramped for numbering. 2 Heart Patterns Within !!! I tried the LTROR (just to challenge myself & see whether it works), instead of the SCMR. It worked great ! 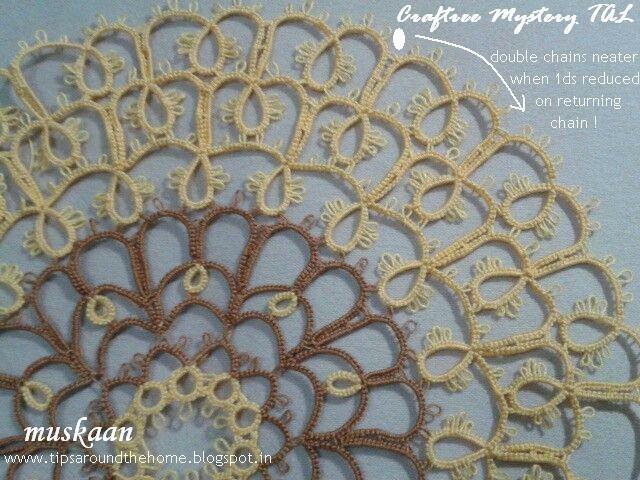 So this doily has Both SCMRs & LTRORs. TIP : LTROR has one advantage over SCMR when working with 2 colours ... no colour blips to hide (no extra step required). When closing the LTROR, softly, but persistently tug the loop to overcome inertia. After that initial resistance, the ring closes Very smoothly. In later repeats, I added an anchoring tiny picot at base of either end of long chains in step #24 & 25 and adjoining chains were joined after 1ds. 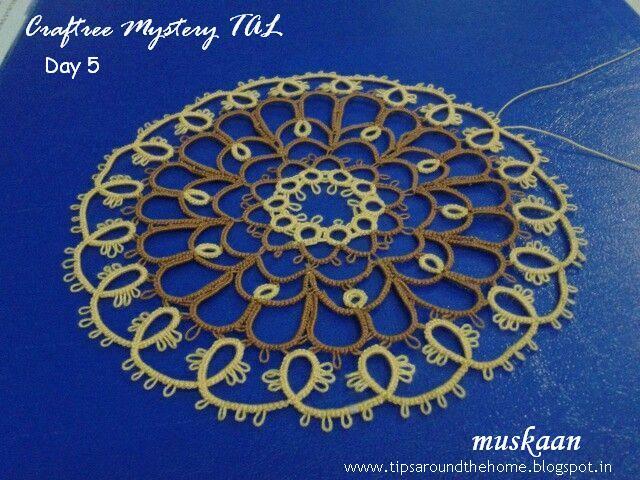 Now that I have experienced the pleasure & effect of size 40 thread (Craftree Mystery TAL), I would’ve loved to try it in the finer thread ! 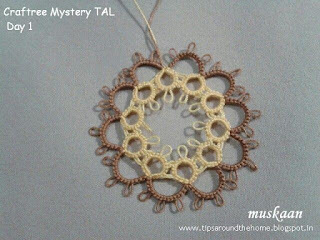 I’m not completely satisfied with my tatting. Could’ve made the double picots a tad longer so as to stand out clearly. 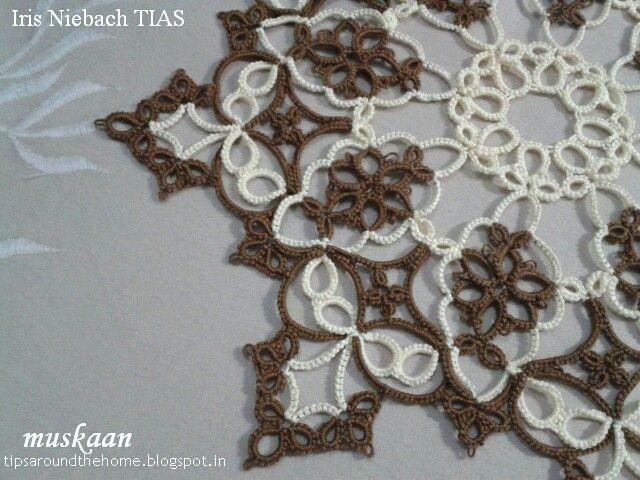 http://tatitandsee.blogspot.in/search/label/Iris%27s%20TIAS – I came across this only now, while confirming some of the links ! 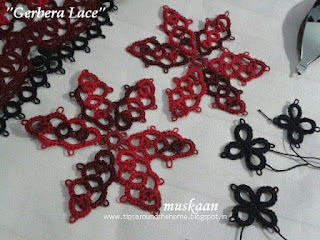 Tatting Away XV : "Gerbera Lace"
This is a name I gave the broad lace when I used the variegated red thread & the central flower looked like a beautiful Gerbera ! I did incorporate a few techniques, but nothing major … have posted about them in earlier tips. 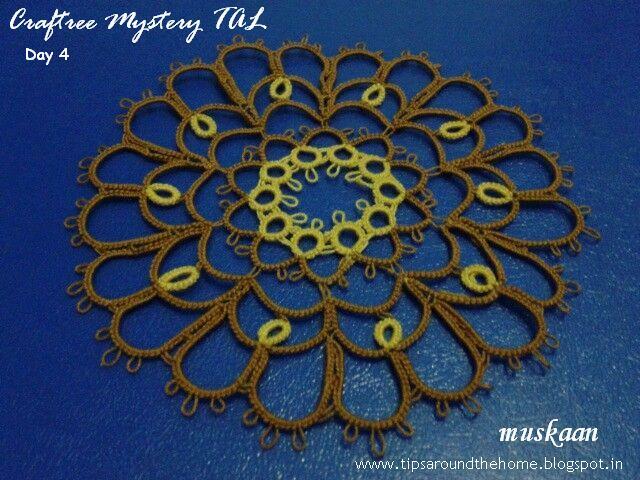 Many that I used in Renulek’s Wiosna here, found their way in the additional repeats. But I like the pattern Very much & any excuse will do to tat it again, with a better colour scheme or in white. And maybe in size 40 this time ! Anchor Mercer Crochet Cotton Size 20. 9 repeats of pattern : 18” long. 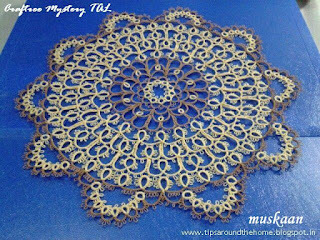 Some rows seem to pucker slightly while tatting. A quick iron after completion, evens that out & lays it flat. The black Red Heart thread was a Pain ! It was too stiff (almost cutting into my fingers), & varied in thickness from the maroons. Even the little black flowers were horrible to tat . While my blog lies neglected, my shuttles & threads are at work. Also learning & trying new things, including beads. It’s tennis season, & a lot of balls are up in the air ! Let’s first get my pattern downloads out of the way (click for direct download). 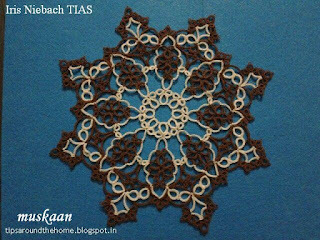 I joined Georgia Seitz’s Online Tatting Class a couple of weeks back & am having such great fun there, while learning a lot & bouncing off ideas. Sharing my ‘homework’ here, as part of my bead-learning experience, and in keeping with the theme of this post, viz., Earrings. 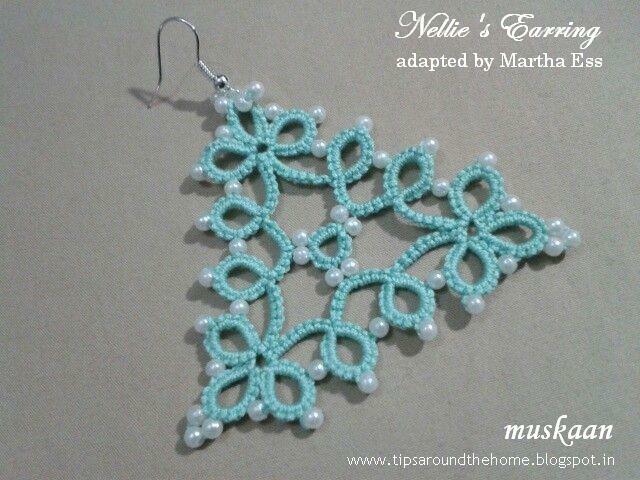 A re-purposed pattern based on Motif #20 by Nellie Youngburg (Forty Original Designs in Tatting). This was a fun fun project. It was made so simple by Martha’s excellent diagramming & perfect instructions. Went smoothly, without a single hitch ! And it was easier to work with larger beads, of course. Chains at base of corner clovers/trefoils are joined by a very small picot to keep them steady (recommended by Georgia). Martha has also turned this pattern into an Angel for Palmetto TatDays 2015 ! This pair of earrings caught my interest Immediately because they have rings within rings ! (I seem to be going round in circles/rings lately) . Clever !!! Verah proposes a pair of thin shuttles to make the interlaced rings. But, of course, I don’t have a set, I haven’t gotten around to making one from any old plastic/cardboard …. So, Could I possibly make them with Normal shuttles – like the Interlaced Rings tuts I posted here ?! Did a quick practice ring with scrap threads. It worked !!! One does require a 3rd shuttle on the go, for the 2 side rings only; and the sequence of tatting changes because the infinity trimming is not added later, but simultaneously. Tat Ring 1. But do not close it. Wrap Shuttle 3 thread around hand as to start a ring, But bring the shuttle Up through R1 from behind/under, on left side, to make the wrap. You will notice that the main ring gets enclosed within this wrap. Complete & close the Interlaced ring on left side of R1. Similarly, start the 2nd part of infinity trimming, bringing Sh3 up through R1 on right side. Complete & close the interlaced ring. (chose favorite method to hide ends). Now close R1 & continue with 2 shuttles. The same steps will be repeated for Ring 3 on other side. I had to make life difficult for myself, of course. Verah listed size 60 thread for the Infinity trimming. I used a double strand of rayon thread, which seemed too tiny when the rings were tatted. 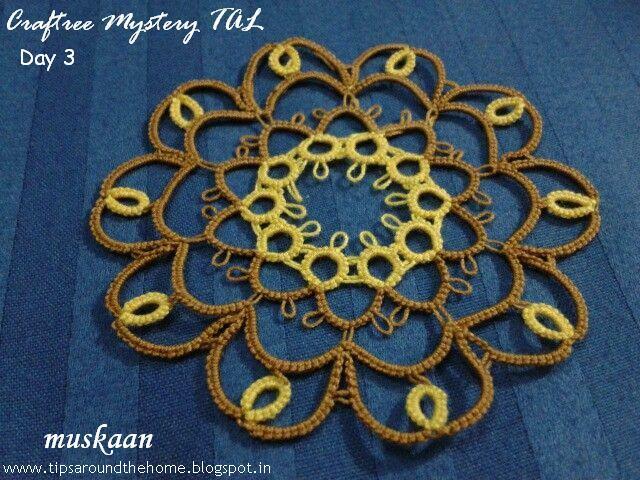 Hence increased stitch count to 20 per ring, & also added 2 extra rings, making the total 4 ! I had a bit of trouble with the written instructions, but focused on the diagram, especially for the placement of beads. This was merely for my learning practice. Miranda (tattingfool) has an excellent pictorial on how to make the LTR (loop tatted ring) , & also a modified method for closing LTR, here. I used the same to make & close the LTROR (loop tatted ring on ring). It works great ! One needs to tug a bit for the final close, but once ‘hooked’ it rolls through smoothly. I’m certainly hooked to this & tried it on Iris’ TIAS doily as well . An added benefit is absence of any colour blip when working with 2 colours. 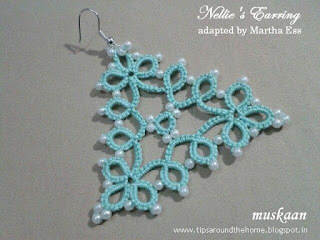 In White size 20 (Anchor Mercer) thread, the earrings measure approx 1¼” x 1½”. 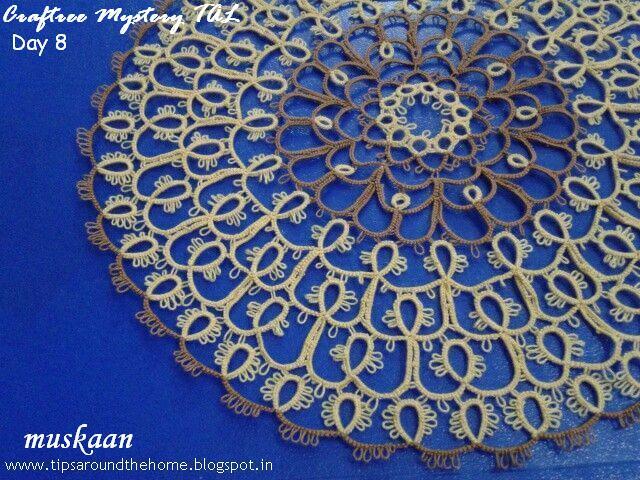 for sharing their lovely patterns, their expertise & wisdom.